Posted in Healthy Home & Pets on February 11, 2013. Last modified on January 31, 2018. Read disclaimer. Many gardeners dream of being the first one in the area picking fresh vegetables. Fortunately, commercial growers and universities have devised a number of techniques that can be adapted by backyard gardeners to produce early vegetable crops. Here are seven examples; you'll no doubt come up with others. Applicable Crops and Limitations. This system may be limited to those crops with a low seed cost, such as watermelon/ muskmelon, cucumber, and summer squash. The seed cost of hybrid watermelon, muskmelon, and cucumber may restrict their use in this system. How It Is Done. Bed up rows with a broad level surface. Starting 2 to 3 weeks before normal planting date and each week thereafter, seed a row 6 to 8 inches away from the row seeded the preceding week. Be sure to keep the rows an equal distance from rows on adjoining beds. Allow all plants to emerge and grow. After the danger of frost has passed, preserve the oldest rows of healthy plants that promise to develop a satisfactory stand; destroy all others. Applicable Crops and Limitations. This system takes advantage of the fact that the south side of the bed warms much faster than the north side. It may be used on almost any crop. It requires a special effort to prepare the bed and do the seeding. A relatively light planter is needed to avoid destroying the row. How It Is Done. Prepare the row in an east to west configuration well in advance of the expected seeding date. Permit the bed to settle and moisture to rise. When you are ready to plant, remove the soil from the upper part of the south side of the bed to a depth of 3 to 4 inches or shape beds to tilt south. Plant shallow because if rainfall occurs between seeding and emergence, it can wash the soil downhill and cover the seed too deeply. Above: Low-cost cloches/hot caps, mentioned in tip #1 above. Got gardening tips you'd care to share? Please leave them in the comments section below. Applicable Crops and Limitations. In addition to the normally transplanted crops, like eggplant, this system is most applicable to melons, okra, squash, and cucumber. It may also be used on sweet corn and pumpkin. How It Is Done. You need a growth structure such as a greenhouse or cold frame. 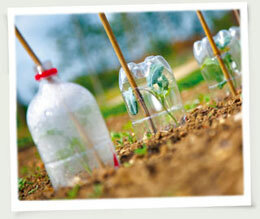 Plant seeds in peat or plastic containers. The larger the container, the longer you can delay transplanting to the field, minimizing transplant shock. Be sure to use a good, sterilized greenhouse potting medium and fill the containers uniformly. Punch holes in the bottom of all containers. Moisten the peat before filling the containers. Put seed into the containers about 4 to 6 weeks before the desired transplanting date, depending on the crop. Under some conditions it may be necessary to suppress the growth rate to avoid overgrown plants. This can be done by lowering the temperature, withholding water, or both. Never withhold fertilizer. Applicable Crops and Limitations. This system is used widely as a protectant for vegetables planted early in areas with stable spring temperatures. It requires constant attention if springtime temperatures vary greatly from day to day. Its primary disadvantage is the cost of installation and constant vigilance to guard against excessive heat buildup and consequent damage to the plants. It may be used with either seeded vegetables or transplants. How It Is Done. Form pieces of wire or conduit into arcs or half circle hoops. These hoops can also be purchased. The width and height of the arc depends on how large or how long you will grow the plants before removing this protection. Usually, 24- to 30-inch widths are adequate. After seeding or transplanting, the hoops are placed over the row 6 to 10 feet apart and clear plastic film is draped over them. Some growers use two strips of plastic held at the top with clothespins. Others use a tie-down system and vent from the bottom. This permits the tunnel to be opened during warm days. Still others use slitted plastic that does not require ventilation. Spun bonded materials have been developed that release excess heat yet offer 2 to 7°F (1 to 4'C) frost protection. These materials make good row covers and require no hoops. Be especially careful during bright clear days to avoid heat buildup that could seriously injury the plants. Opaque plastic is usually preferred. Applicable Crops and Limitations. This system is most appropriate for tomato, pepper, and eggplant and somewhat appropriate for watermelon, squash, and muskmelon. Primarily, it allows you to grow your crop longer in the greenhouse or cold frame. To do this you need larger containers and more space. How It Is Done. 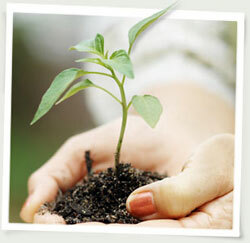 Seed directly or transplant small seedlings into 3-to 5-inch containers. When placing them on the greenhouse bench, allow at least 1 inch between containers in all directions. Fill the voids between the containers with the same planting medium that you used in the container. You may also use well-rotted, sterilized sawdust or similar material for the filler. Use standard growing procedures but start the plants about 1 to 3 weeks earlier than usual. Transplant to the garden when the chance of freezing or frost has diminished. Applicable Crops and Limitations. Almost all transplanted vegetables will produce earlier when mulched with either plastic or newspaper or kraft paper films. Some crops that are likely to succeed on film mulches are strawberries, muskmelon, watermelon, eggplant, pepper, tomato, cucumber, and squash. How It Is Done. Before the film is put down, any fertilizer you plan to use must be applied and the soil tilled, raked smooth and well watered. Spread the film to cover each row where you will be planting (if using newspapers, they will need to be 10-15 sheets thick and you may need to be watered down to keep them in place). Edges of the film can be tucked into the soil or held down by boards or dirt. Crops may be seeded or transplanted through the film by making an appropriate-sized hole. Be sure all peat or fiber containers are completely covered and well watered after transplanting. If these containers are exposed, they act as a wick and will dry out. Temperatures under clear plastic are higher than under black, however, weeds will grow under clear plastic. Black or opaque plastic is usually preferred. New films that transmit some light rays will warm the soil more than black plastic yet not allow weeds to grow. An alternative type of film reflects UV rays onto plants to stimulate even faster plant growth while confusing and repelling insect pests. Applicable Crops and Limitations. Hot caps may be used on almost any crop on a small scale. Hot caps, which you can buy at a wide variety of agricultural supply houses, are generally constructed of plastic, cardboard, or waxed paper. How It Is Done. Place hot caps over the plant and secure the cap with a handful of soil or some device to keep it from blowing away. On very warm days, remove the cap or make a slit in the top to allow excess heat to escape. Choose Light, Sandy Soils. Because they hold large quantities of water, clays and poorly drained dark soils warm very slowly. Light-colored, sandy soils hold less water, warm much faster in the spring, and aid in promoting early growth. Light soils are even more effective when used in conjunction with other techniques such as mulching with films. Fall Plowing. Gardeners often cannot produce early vegetables because excess moisture keeps them out of the garden in early spring. Where practical, preparing rows in the fall reduces the amount of work that must be done in the spring and permits much earlier planting. Examples of crops that could be spring-planted in fall-made rows include onion, cabbage, broccoli, and cauliflower. Covering the rows with cardboard or newspapers in the fall provides a fresh, weed-free soil in which to transplant or seed in the spring. Raised Beds. Ridging rows exposes more of the soil surface to the sun's rays and results in higher temperatures and faster seed germination and growth. In addition, the elevated rows permit excess moisture to drain away faster and allows greater aeration of the root zone. Raised rows may also reduce seedling diseases. This technique offers only limited increase in earliness when used alone. It is most effective on seeded crops. Early Varieties. Several vegetables have only limited variety differences in earliness. Others, like tomatoes, have a wide variation in maturity. For example, Early Girl, Spring Giani, Fantastic, Pik Red, and Sunrise produce ripe tomatoes several days before some later varieties like Mountain Pride. Hybrid squash and cucumbers are often 2 to 4 days earlier than open pollinated varieties. Stimulate Seed. Seed priming (soaking seeds overnight) can promote more rapid and uniform emergence, resulting in earlier crops. If, for any reason soaked seeds can not be planted the next day, they can be surface-dried and stored for several days before planting -- and they will still perform better than non-primed seeds. You may find it easier to handle and soaked seeds if you dry them before handling; simply scatter them on a cloth or paper and set them in the sun. If possible, plant them that same day. Oversoaking, will cause seeds to germinate and sprout. In most cases, they will be fine but they must be kept watered immediately after planting.